Mihoko Suzuki earned her A.B. in an interdisciplinary major, History and Literature, in the College Scholar Program at Cornell University and her Ph.D. in Comparative Literature at Yale University. Her scholarship focuses on Renaissance and early modern literature and culture, English and European, with an emphasis on gender and authorship. She is the author of two books. Metamorphoses of Helen: Authority, Difference, and the Epic examines the figure of Helen of Troy as a figure of difference for literary and political authority in classical and Renaissance epic. Subordinate Subjects: Gender, the Political Nation, and Literary Form in England, 1588-1688, argues for the importance of the contribution of non-aristocratic men and women to the political conversation leading up to, during, and after the tumultuous years of the English Revolution. In addition, she has edited or coedited six books, mostly on gender in the early modern period (Debating Gender in Early Modern England, 1500-1700; The Rule of Women in Early Modern Europe), but also on contemporary feminist criticism (Diversifying the Discourse). She has also edited the writings of and about Mary Carleton and Elizabeth Cellier, notable (and notorious) women writers in seventeenth-century England, as well as coedited a 4-volume collection of printed and manuscript texts, Women’s Political Writings, 1610-1725. Her most recent book is volume 3 of the 10-volume Palgrave History of British Women’s Writing (1610-90). She has published articles in journals such as Classical and Modern Literature, Comparative Literature Studies, Literature Compass, The Seventeenth Century, Theatre Journal, Tulsa Studies in Women's Literature, Women's Writing, among others, and in essay collections, most recently in A History of Early Modern Women's Writing (2017). Her current research aims to revise the history of political thought, which has heretofore focused almost exclusively on formal treatises written by such thinkers as Machiavelli, Hobbes, and Locke, by examining the works of early modern women writing in various genres. 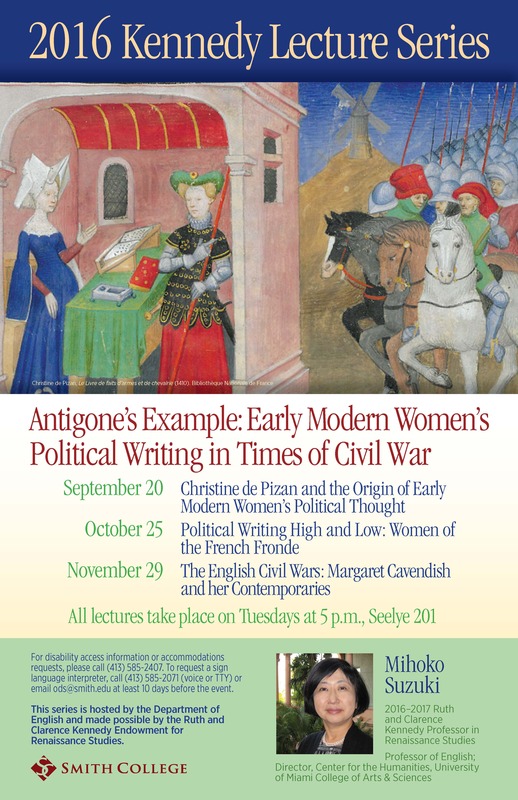 She is now completing Antigone’s Example: Women's Political Writings in Times of Civil War, centering on the seventeenth-century civil wars in England (1640-1660) and France (1648-53), but also extending forward to the early fifteenth century (Christine de Pizan) and the early nineteenth century (Helen Maria Williams). She has been awarded research fellowships for this project by the Folger Shakespeare Library and the New York Public Library; during fall 2016 presented three public lectures drawn from this project at Smith College as Ruth and Clarence Kennedy Professor of Renaissance Studies. 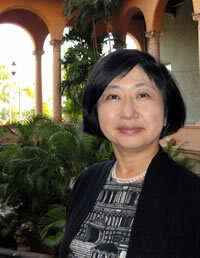 Suzuki coedited along with her University of Miami colleagues, Anne J. Cruz (MLL) and Mary Lindemann (History), six volumes of Early Modern Women: An Interdisciplinary Journal (2011-17). With Ann Rosalind Jones and Jyotsna Singh, she coedited Transculturalisms, 1400-1700, a book series for Ashgate/Routledge. She now coedits New Transculturalisms, 1400-1800 for Palgrave Macmillan. She served for many years as review editor for Clio: A Journal of Literature, History, and the Philosophy of History. She has been an active member of various professional organizations. She is currently the Vice President and President-elect of the International Margaret Cavendish Society (from which she received the 2017 Sylvia Bowerbank Award). She served on the Modern Language Association's Executive Committee of the division on Seventeenth-Century English Literature. She has served on the Advisory Committee of PMLA, the journal of the Modern Language Association and has been the Chair of the selection committee for the William Riley Parker Prize (for the best article in PMLA). She has also been a member of the Executive Council of the Sixteenth Century Studies Society, an association of scholars from all disciplines in early modern studies, including history, art history, religion, history of science, musicology, and literary and cultural studies in English, French, German, Italian, and Spanish. She has served as President of the interdisciplinary Society for the Study of Early Modern Women, which includes scholars in English, French, Italian, German, and Spanish literature, history, history of science, art history, and music, and has served as President of the Women’s Caucus of the Modern Language Association, the professional association of scholars and teachers in English and modern languages. At the University of Miami, before she was appointed the inaugural Director of the Center for the Humanities, she served as Director of Graduate Studies for the Department of English, as well as Director of the Program in Women’s Studies.